Approaching strangers. Making demands with menaces. Sugar bingeing. Trick or treating is against every rule in the parent handbook, and in a new monthly column on family life, one writer says the biggest fright is what kids expect of Halloween today. Dressing up in a scary costume and cadging chocolate and money is an irresistible business proposition for any child. But should we be encouraging them? Is it harmless fun or an irritating excuse to annoy the neighbours? The rest of the year we warn children about the dangers of strangers - and then under the guise of trick or treating, encourage youngsters to dress in masks and knock on doors, demanding money. Every autumn, after the first volleys of bootleg fireworks have flown across the night sky, the ritual begins. There's a tap on the door and standing in the streetlight, silhouetted by the neighbour's security light, is a gaggle of young teenagers. One wears a broken plastic horror movie mask. Another has the script. "Trick or treat." That's about the limit of the rich cultural fare on offer. They want money, they might put up with sweets. They're certainly not giving anything back in exchange. Like all respectable people, the obvious tactic is to make out that it's great fun and then pretend to be out when the next bunch call round. Turn off the lights, duck under the windows and turn down the television - all to show that you're not a killjoy. Hold on, when did trick or treating become such a fixture? Will you be welcoming trick or treaters tonight? When John Noakes was the nation's uncle on Blue Peter in the 1970s, his seasonal advice at this time of year was to keep dogs indoors on Guy Fawkes Night. But Val, John and Peter never tapped up the neighbours for loose change. Because trick or treat isn't a tradition. In the 80s it was still viewed as an exotic and not particularly welcome import, the Japanese knotweed of festivals. On Halloween in 1986, the House of Lords debated the "recently imported trick-or-treat custom of demanding money on threat of playing a nasty trick, now being used by youths to obtain money from old people and others". Their lordships saw trick or treating not as a tradition, but as American for begging. But today's children can't wait to don cobweb costumes and get spookifying with their witches hats, fake blood and plastic spiders. Maybe I'm being too harsh. This could be what daytime television calls a learning experience. There's even seasonal advice about how trick or treating can be more than a binge-fest. "New Trick or Treating Traditions: Serve a healthy and nutritious dinner before your children set out for a night of candy-collecting. During the meal, take the opportunity to discuss trick or treat safety, as well as the importance of healthy diet and lifestyle choices." Yeah, right. Apart from the quibble over whether you can have "new traditions", who are these people who believe in this chat about healthy diets before ram-raiding for chocolate? It's the National Confectioners Association. It's like believing in the Filled Tooth Fairy. For small children - accompanied of course by a responsible adult - who could argue with the excitement of a night-time fancy dress party. So why does it still rankle? Maybe it's the way that Halloween has been hijacked by trick or treating. Halloween is an authentically ancient festival, about the links between life and death, the struggle between light and dark. Trick or treating is a consumer proposition. It's a sales pitch, not a festival. 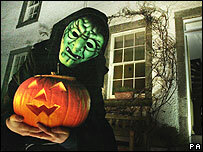 Spook-related spending in the UK has risen tenfold in a decade, up to £120m. 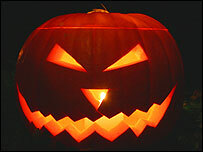 In the US, Halloween is worth $5bn a year to retailers. This clash between cash and culture is obvious when those teenagers arrive on the doorstep. There's no carol singing, no bob-a-jobbing, just a hand out for a handout. With depressing predictability, Halloween has become a source of fear rather than fun. Residents are offered "No trick or treaters" posters to deter callers. And in north Wiltshire, the police are planning to wear "head-cams" to record evidence of intimidation or vandalism. I'll be wearing a Mr Grumpy mask either way, as my small witches shout that it's time to take them trick or treating. But it pays never to mess with a witch wearing Velcro shoes and glue-glitter. Trick or treat is a corruption of the old Scottish tradition of Guising (disguising) reimported back to the UK.Guisers are not supposed to beg for money/sweets they are expected to entertain.Recite poems, sing, dance or play an instrument. Group of children do it together dividing the spoils at the end of the night.Sadly this old tradition is dying here too due to Trick or Treating. Perhaps we cannot complain too much as we started it in the first place! Last year I gave trick or treaters my usual gift only to hear them say as they walked down the path, 'not more oranges'. Next morning I found the discarded fruit in our flower bed. I hate Hallowe'en. I believe that it is hugely harmful to pretend that dressing up and 'being' a witch or the Devil is a fun thing to do. Not only does it frighten and intimidate the elderly and single people, I feel that it is just so inappropriate to be basically celebrating evil. I don't have children, but if and when I do, I will not be allowing my children to go and harrass people into giving them stuff under an evil guise. Hallowe'en- harmless fun? I don't think so. Probably the tackiest festival there is. It should be banned on the grounds that it is no longer a festival of any sort, but a painfully corny parody of one. I would have expected this article to make some reference to the Scottish traditions at Hallowe'en. This time has long been celebrated in Scotland with traditonal activities including dookin' for apples, catching a hanging treacle pancake in your mouth with hands behind you; and making turnip (not pumpkin) lanterns. The main thing is 'guising' where the children dress up and entertain the neighbours; in return being rewarded with some sweeties or coins. Yes its become Americanised but it is a Scottish tradtion. What a whiny report, I went trick-or-treating as a child, and was always welcomed into my neighbours homes as the tried to guess who was underneath the costumes. The attention recieved and the amount of effort that went into our costumes were far more rewarding than the actual "treats" and we went home to party games such as bobbing for apples. This year i will be welcoming any ghosts or goblins that come to my house, and be delighted to see how the kids react for the one night when they are allowed to "go against every rule in the parent handbook"
I am not looking forward to this evening, living in a residential area and likely to be subject to repeated disturbances from the local trick or treaters. None of them will consider that we have a 9 month old son upstairs in bed who they will disturb. I agree with the general comments about the 'commercialisation' of Halloween, it's becoming nothing more than a good excuse for demanding money from strangers. While I was at University in the USA, our dormatory arranged for the children from local care homes to come in at Halloween, we made a big fuss of them and it seemed to be the best way I could think of to recognise the event and also do some good for the community. Licensed begging. An excuse for intimidation. Eggs, stones and worse thrown at windows and doors just for the hell of it. It's not a tradition I recognise. I'm hoping the police will try to enforce some level of control tonight. I doubt it though. I moved to Canada from Britain in the mid 90s, and at first, treated trick-or-treating with a healthy suspicion. However, I soon realized, that in my neck of the woods at least, Halloween is more about fun than menace; it's about the treat rather than the trick. In our neighbourhood, it's mainly young kids who come trick-or-treating with their parents. We also get a few older teens who come by, almost self-deprecatingly, and we always compliment them on their costumes, or berate them gently for their lack of effort, but fill their bags nonetheless. No menaces, no threats. I was back in England last Hallowe'en and was surprised to see and hear the healthy antagonism there was against trick or treaters. Friends and family all had signs in their windows, weren't planning to answer the door, couldn't understand why my seven year-old wanted to dress up and go out after dark with a bag looking for treats. I think in England, what has happened is that the message has been lost in translation, and over the years the idea of treat has supplanted that of trick. Maybe you should all come over here and go trick-or-treating with my little ones tonight - then you'd have a better understanding of how it *should* work! I think you're looking at Halloween the wrong way. When so many people don't know any of their neighbours and a general muttering about the breakdown of the local community what better than to have children feel able to make connections and meet people. Why not treat this as an opportunity to meet people around you and forge new connections in your area. Why shouldnt halloween be celebrated ? 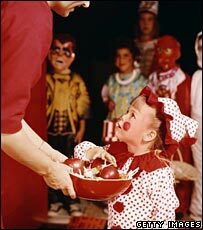 Its harmless fun and most children enjoy dressing up and get a real buzz out of the excitment. I think that people should lighten up and remember that when they were kids they probably celebrated halloween too.